She prefered a good book, remember? Das Kapital for economic theory? Mein Kampf for political management? "I wonder if Helen would have done it? "Probably not but who cares? Should she have? If you're asking this question I would assume you have a bit of a chip on your shoulder. Weak, man. I'm not quite sure what the point of this post is. Helen Clark was a well known rugby league (and other sports) supporter. However, is league (and even the Warriors) something you really want to be associated with given the recent scandals and results? Um, Sean, this was meant to be a light-hearted post (see the 'humour' tag?). I wondered if anyone else had seen it. Lighten up, dude..
Mike Graham, there has been scandal? I'm sorry, but I must confess right here that I don't follow sports - at all. The most important All Blacks game of the season could be on TV and I wouldn't know. 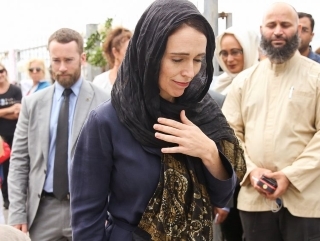 I just posted the picture because I thought it was amusing, Key looked so staunch, and I wondered if anyone else had seen it. I'm not trying to make a point, political, sporting, or otherwise. Am I not allowed to post fun things? I enjoy a good joke, but you seemed to be making a political point by saying "I wonder if Helen would have done it?" Re scandal - only that rugby league players (and ex-players) seem to be in the news more because of what happens in bed rather than on the field. Fletch, you are NOT ALLOWED to joke about Dear Leader, even though she's left the room, ok? 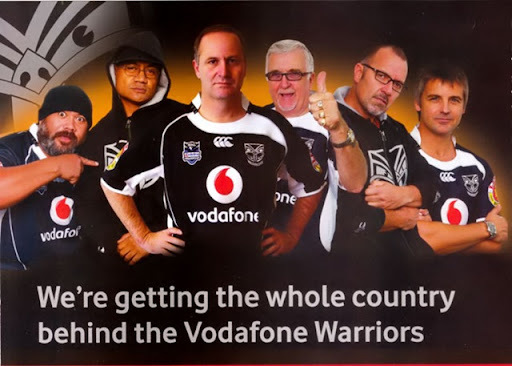 Neither is it acceptable to make jokes about football or whatever the Vodafone Warriors are. Because some footballers have been implicated in some dodgy sexual shenanigans. Which--naturally--means they're all guilty of it. Didn't you have a pic of Key looking staunch in front of a netball team or something? That would probably pass the censors. Okay so I noticed the comical mood of the flyer but I missed the auto cue to laugh at the punchline.